Designed to fit the most popular 15" active and passive portable PA speaker cabinets, the Gator Cases Nylon Speaker Tote is made from a rugged water-resistant polyester material, and features soft interior padding to give your valuable speaker 360° protection. The bag's dual zipper design opens the top of the bag for easy, upright loading and unloading. With a dual handle, secure-wrap setup designed to evenly disperse the weight of the bag's contents, the Gator Cases Speaker Tote makes it possible to easily carry your speaker comfortably with one hand. Not only does the reinforced, dual handle design reduce wear on the bag itself, it allows you to carry two speakers at once to speed up loading. 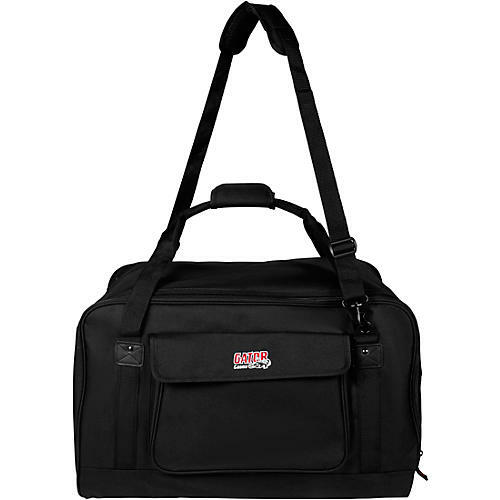 If you depend on your gear for your livelihood and keeping a professional appearance is important to your business, protecting your valuable equipment from damage during transport with a quality tote bag is your first line of defense. The Gator Cases Speaker Tote keeps your professional speaker looking like new, safeguarding against scratches, gouges, dents and dings, gig after gig. A convenient hook-and-loop accessory pouch on the side of the tote bag provides a perfect place to store speaker cables, IEC cords and other necessities you depend on at gigs.